Microfiber cloths are the best, easiest and most effective cloths to use when cleaning. In order to truly appreciate how well these cloths clean, it helps to understand what microfiber actually is. Microfiber is synthetic fibre made up of tiny strands that are smaller than strands of silk which are 1/5 the diameter of human hair. That is tiny! During the manufacturing process, fibers are split, producing multi-stranded fibers. If you cut a cross-section of fiber, under high magnification it would look like an asterisk. The split fibers and the size of the individual filaments working in conjunction with the spaces between them make the cloths more effective than other fabrics for cleaning purposes. The structure traps and retains the dirt extremely well, and also absorbs liquids. Microfiber cloths are very soft and hold their shape well. The best microfiber, especially for water-soluble soils and waxes, should be a split microfiber. Non-split microfiber is little more than a very soft cloth. Microfiber cloths clean on a microscopic scale. Using Microfiber materials to clean a surface leads to reducing the number of bacteria by 99%. Standard or regular cleaning cloths reduces this number only by 33%. The increased surface area of a microfiber cloth leaves no lint behind on the surface you are cleaning, unlike a cotton cloth that leaves lint. There is one exception; some cloths are microfiber blends where the surface has been mechanically processed to produce a soft plush feel. These cloths can leave lint behind. Microfiber cloths are electrostatic so they grab or attract dust better than other cleaning cloths. Even though microfiber cloths are more expensive, the overall cost of cleaning can be lower because you can get more use out of a microfiber rag before it is completely soiled and you can often clean very effectively using far less chemical or cleaning solution than a standard cotton rag. For example, you don’t have to use glass cleaner to clean mirrors and glass; a little water in a spray bottle and a microfiber cloth will do a great job. A big plus about this is you are not putting more chemicals into your home and into the environment. Microfiber can hold up to eight times its weight in water. It also has the exceptional ability of being able to absorb oils and it is not hard enough to scratch even delicate surfaces, unless they have retained grit or hard particles from previous use. Microfiber cloths are used to clean photographic lenses as they absorb oily matter without being abrasive or leaving a residue. Small microfiber cleaning cloths are commonly sold for cleaning computer screens and sun and eyeglasses. Microfiber cloths can be used wet or dry, on many surfaces, with or without cleaning solutions or chemicals. Cleaning techniques are important regardless of the type of cloth you are using. Because microfiber works so well at attracting and holding dust and dirt, it accumulates grit so it can damage high tech coated surfaces, as previously mentioned. Always use perfectly clean cloths when cleaning these type of surfaces. 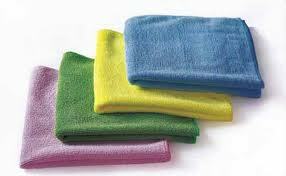 Microfiber Cloths must only be washed in regular washing detergent, not oily, self-softening, soap-based detergents. Fabric softener should not be used. The oils in the softener and self-softening detergents will clog up the fibers and make them less effective until the oils are washed out. Also never wash microfiber cloths with non-microfiber towels or clothes. Typically those fabrics have so much more lint. You will find the microfiber cloths will grab the lint from the non-microfiber materials and next time you use the microfiber cloth, it will leave lint behind on the surface you just cleaned. Microfiber cloths are an amazing innovation, making the job of cleaning much easier. Now that you understand what microfiber is and how is it used, you can fully benefit from using microfiber cloths in your cleaning tasks.